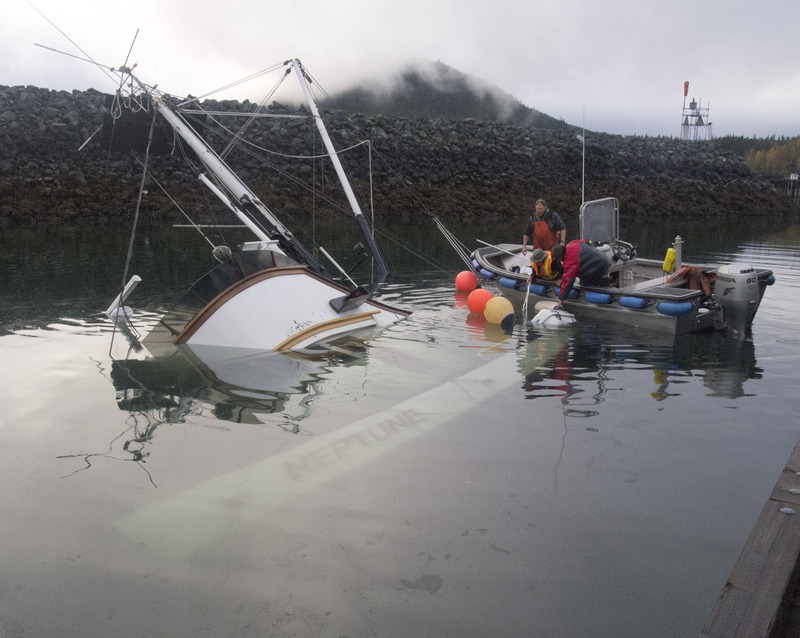 A salvage operation and clean-up efforts are still underway in Haines, where a 78-foot tender sank last weekend in the boat harbor. The tender Neptune is being raised from the bottom of the Haines Harbor, although progress is going more slowly than anticipated. That’s according to Coast Guard Lt. Ryan Erikson who has been on scene this week observing the salvage operation and monitoring the leaking fuel from the vessel that is polluting the harbor. But now that the boat is at least partly above water, containment booms surrounding the harbor were removed Thursday. Booms remain around the tender to contain fuel and oils still leaking and cleanup continues, but boats are now able to move freely in and out of the harbor. The Neptune sank while moored at the harbor Saturday, Oct. 5. Containment booms were placed at the harbor’s entrance and no fuel was reported to have escaped into Port Chilkoot or Lynn Canal, but the state and Coast Guard required boats leaving the harbor, including the Haines fishing fleet, get hosed down at a decontamination station. The boat’s owner estimated there was about 1,600 gallons of fuel on board when it sank. It’s unclear how much of that leaked, but it’s far less than the 10,000 gallon benchmark that would make it a major spill, Erikson said. Erikson said it’s unlikely the spill will have any lasting effect. Wind and rain will continue to help dissipate the fuel, he said. And it doesn’t seem to have affected any wildlife. Pam Randles with the Takshanuk Watershed Council in Haines on Tuesday surveyed the harbor and nearby shores. She said she didn’t find any sick or dead wildlife. A marine salvager from Juneau is working on floating and pulling the boat from the water, working with the tides. Once ashore, Erikson said the Coast Guard will investigate the cause of the sinking. A marine surveyor will also determine if the 76-year-old wooden tender can be fixed and returned to the sea.